Hi friends! I hope you're having a great day! We are off to a baby sale thing in a little bit to try to pick up some clothes for the kids and maybe the baby. Then a couple errands but that's it today. What are you up to? Today, I'm sharing a card I made for a call that wasn't picked up. I still love this one. I think it's fresh and the colors are fun. The stamps are from Paper Smooches, the paper is from Lily Bee, and I finished with some Lemon Divine Twine. This is so cute Ashley. Love those butterflies. totally love your card of course i love butterflies but this is cute cute. It's adorable! Love the fun colors with the butterflies. Aw, this is so sweet! 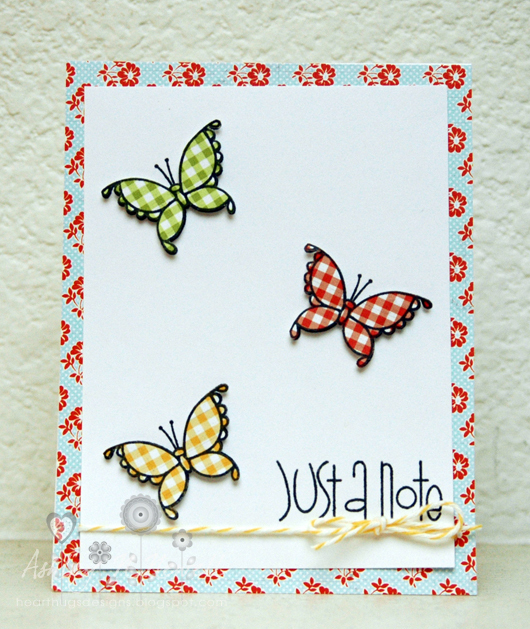 I love those gingham butterflies!